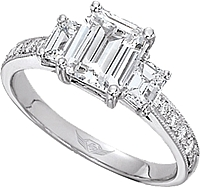 At Since1910, we carry some of the finest, most sought after designer brand engagement rings on the market. Throughout our almost 100 years of service, we've established relationships with some of the most exclusive designers and are able to bring these settings to you at a level of quality and value that can't be beat. The process involved in making each Tacori setting is an intricate combination of art and science. A tradition of craftsmanship and attention to detail culminates in the creation of a true Tacori treasure, and a fitting symbol of the beauty of your love. Scott Kay has been making jewelry for more than 30 years. He studied the craft at the Fashion Institute of Technology in Manhattan. With his experience and expertise, he started his own company in 1984 to follow his passion for innovative jewelry design. His brand is currently among the world's most coveted for beauty, luxury and quality. When a man stamps his name on a product, as in the case of Martin Flyer engagement rings, you are guaranteed a wedding band of excellence. With the Flyer trademark signature engraved on each piece of bridal jewelry, it gives your love wings to fly. 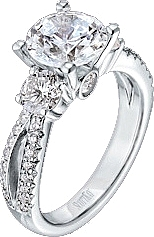 Henri Daussi is known throughout the industry as being one of the premier European fine setting designers. Each setting is made by hand using modern techniques coupled with old world craftsmanship. This bridal line by Henri Daussi is truly unique and something very special. Unique and cutting-edge, yet at the same time evoking old-world elegance. Simon G, who established his company in 1981, is considered one of the most creative jewelers today, crafting beautifully detailed pieces from the most precious of materials. 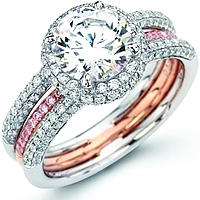 Created with the utmost precision and perfection, engagement rings by Vatche are fine works of art for deserving brides-to-be. Vatche jewelry are made and guaranteed to last for generations — each special ring is crafted understanding each piece is a future heirloom.